For anyone that every wanted x-ray vision, these shirts are for you. They are also great for med students during exams. So here’s the backstory on how i found these - we were printing shirts - and Caroline (yes, the intern) started on about this fabulous vintage shirt she stole from a friend while living in Rome, but unfortunately he stole it back. First made back in the late 70s we didn’t think it would be possible to find again… but low and behold the artist is still making them. And there is quite a story behind it. This isn’t just any t-shrt designer. These Skeletees are the work of Dr. Leslie Arwin. Yes a medical doctor. She’s a physician, medical illustrator, and anatomist, and “can assure you that her T-shirts are 100% anatomically correct.” Besides these two designs (the front and back of the bones T, and the Stomach T) - there are also muscle tees, nerves tees, and apparently a heart, x-ray, and “keep on tickin’” shirt that dont have images on the site yet. Wow. I wish i had these during AP Bio. I wonder if they glow under black lights. I love companies where the philosophies are well grounded in the passions of the owners/workers. And the Paris House seems to have understood and embodied this notion whole heartedly from day one. As a designer - Sharon Paris managed to combine her background as a conceptual artist - and her ability to create some fascinating leather wallets, etc which all have text to draw you in, make you think - and thats not enough, she takes you on a ride through mental illness in this collection (even donating 10%). And packaging is fun stuff. She provides you with a pot of New Zealand bee’s wax to preserve the leathers ~ one of the first lines contained beeswax with “what’s so wrong with taking care of each other?” imprinted in it. Colin Rundel does this weeks digital curation of .org —- which has been under much craziness lately - for those of you who have noticed the periodic construction and such. The more complexity through features we add, the more bugs (some absolutely bizarre as far as my logic can determine) pop up - and the more fixing and backing up - and LEARNING happens on this side. But no posts have been lost - the RSS feed is on hold till we finalize our db to a stable state… so post away. Still loving the content, in fact i’m proud to say that i think you have all been getting better and better at it! And i’m addicted! That said here’s what Colin picked for you : This week all kinds of beautiful prints from .org and a few other random bits and pieces. Prints on a swing seat, prints that really are for your wall and prints of a happy little anteater to tie it all together. If that doesn’t do it for you how about some painted access panels from utility posts around the streets of barcelona or the truly bizarre jewelry from cultured bone tissue. This isn’t your average drinking tour of LA… as a native its come to my attention that i might quite possibly take the abundance of designer water available for granted. It is simply a way of life. Our new NOTCOT Intern, Caroline Freedman ran around town today to give you a rundown of what’s on our shelves, and keeping us hydrated during this bizarrely humid heatwave. Water is water in a designer bottle that makes you want to buy it, drink it, treasure it, and then buy another. Do you have a favorite? Show us some we missed? And readers - she wants to make you happy. So give me some feedback here ~ this NYU girl is ready to run around LA and find you the designer goods to make you drool over - but we need some direction - what are YOU interested in? What do you think of her roundup below? Guest Writer, Colin Rundel - Last Tuesday we had the privilege to join GenArt and Tiffany&Co at the launch of the new Frank Gehry Collection at their store over in Century City. Love him or hate him, Gehry is undoubtedly one of the most well known architects of our time, with claims to fame like the Disney Concert Hall here in LA, and the Guggenhein Museum in Bilbao. This new lines seems to pay homage to some of his classics, using similar lines and themes - from the playfulness of the Fish collection to the bent shapes of Fold. Even the loopy and complicated pattern of classic Gehry sketches are captured in the intricate connections of the Torque collection. While not everything has the same dramatic impact, this line does an incredible job of merging the simple beauty of Tiffany&Co. with the architectural form of Gehry to a great effect and is well worth viewing in person. 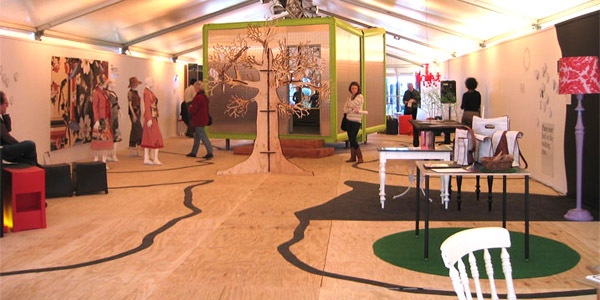 Guest Post by Lucy Feagins - The Melbourne Design Festival is only a baby. It’s in its second year, and is still very limited in size and scope. You certainly wouldn’t want to compare it to international festivals. However, it’s always fun to see new work showcased, so if you can resist the urge to make comparisons to the ‘World Class’ events happening in Milan, New York, London etc… then there’s still inspiration to be found in little old Melbourne. It was fun to have a list of (mainly free) forums, lectures, workshops etc to attend all over town, as well as the usual product/trade exhibitions… and any design festival has to be better than no design festival! 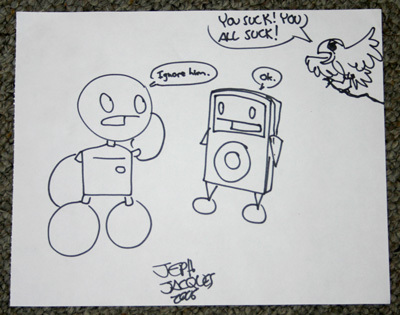 I have my morning rituals, by morning i mean just past midnight, and Jeph Jacques’ Questionable Content has been a part of that for years. Pintsize and Winslow never cease to amuse me… and Faye, Raven, Martin, Hannelore, etc make me smile. So you can imagine how exciting it was to meet the man behind the daily comic - have him draw a scene of my favorite characters (i’m also a huge fan of the snarky IndieTits.) And this one is so getting framed and going up in the NOTCOT studio for life - it kind of embodies how we all feel at one time or another… aka - stop listening to the silly people out there and do your thing. Hit up the Comicon this weekend - hence the quiet posting lull. But be nice. It was busy/crazy and far too much to take in at once. So here i show you the king of schwag - ROCKSTAR GAMES - yes the gaming folks of GTA and such… and this is all to promote their new Table Tennis game on XBOX 360… SUCH a fun game, and i don’t even like ping pong. Ended up at their party over at the Airport Lounge on India St. in San Diego Friday night, and it was more fun than i can describe to you. So i won’t and instead will show you some pics below. Basically this open air lounge directly under the flight path had large projections of the game on two of the courtyard walls… and video installation art going on inside as well as djs spinning the night away. Any band that can rock the US all summer long touring… sponsored and playing their way through the LIBRARIES of America and have gorgeous posters and cover art is ok in my books. Even if they ARE “Harry and the Potters”, i think i might have to go check out out their show at the La Public Library. Yes i will be that big kid in the back. I posted one of their videos on .org a while back ~ and you can hit up their myspace for some listening pleasure. They crack me up. Check out the sweet cover art here… can you believe they have 3 albums? Oh and that Draco and the Malfoys are opening for them? And in case you haven’t guessed yet - they are pretty emo. I’m sure by now i can’t hide that i never outgrew my cartoon loving, sugar craving kid within. So it should come as no surprise when i tell you that i’m slow today on posts (but have quite a bit of amazing larger features on the list to post for you!) - because i need to pop down to Comicon and see what all the fuss is about, and check out new toys. But i’ll be back! Also, we might be in need of help/hiring/need more fun people to come play with us and find cool stuff or design with us. I’m deciding. But you know how to contact me if this even remotely piques your interest. But for now, how fun are these kids shirts? These icons epitomize some of the phases of my childhood obsessions. Go JEETO! … also their Allergy Collection is freaking brilliant… see below. Git along little doggie, git along git along…that’s right boys and girls, its time for the weekly .org roundup. It’s been another wild week at .org with generous posting by plenty of the old crew as well as some classy contributions from the new school. We’ve got fab tintin figurines, a gorgeous ecosmart fireplace, sunlight trapped in a jar, the ever-so-handy self-destruct button and floating tigers. Keep posting .orgers! —- This week’s were digitaly picked for you by RUGenius. The Wonder Collection by Sarah Troper is better than sliced bread. The rings actually ARE sliced bread - white, with the wonder colored dots inside - and there are even ends to this loaf! And the matching necklaces are adorable as well - a MUCH more unique twist to those BFF snap a heart in two give one to your friend necklaces of our childhoods. via .org by *43.